We have recently created a new blog “Disaster Memory: Understanding social memory of extreme events and disasters” (http://disastermemory.wordpress.com/) to explore how human experience of extreme weather and natural disasters is encoded and archived in memory; how individual and collective memory of past events is recalled to make sense of present experience; and how these processes shape society’s responses to natural disasters. The blog provides a space for exploration and exchange of ‘disaster memory’ stories, and in doing so illuminates avenues for learning. 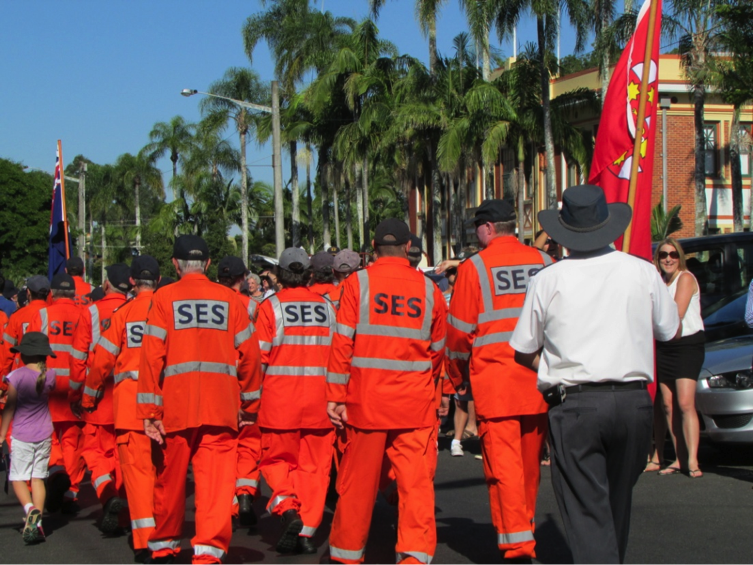 One of the themes currently under discussion in the blog is the role of culture and national identity in disaster memory: in Australia the State Emergency Service (SES) volunteers are in the front line of disaster response and therefore in the front line of experiential learning. Photo by Anne Leitch. Local, place-based knowledge about social-ecological systems is thought to build resilience to uncertainty and rapid change, such as that posed by natural disasters. Learning from such knowledge is considered critical for societies living in disaster-prone areas such as coastlines, floodplains and peri-urban bushland. Less widely appreciated are the processes by which knowledge is harnessed to respond to disasters. Among these is social memory—“the long-term communal understanding of the dynamics of environmental change, and the transmission of the pertinent experience (McIntosh 2000:24)”—that becomes salient as societies anticipate and recover from disaster events. While disaster management and risk reduction are expanding to encompass the role of human agency and behaviour, these domains can benefit further from the various scholarly traditions on knowledge and memory and how they relate to resilience. For example, anthropology recognises knowledge as fluid and embedded in social and cultural practice, rather than a static repository of past responses to disturbances without historical context. Cognitive psychology approaches appreciate that memory includes the subjective experience of remembering and that memory is prone to distortions. However, how memory scales up to larger social groups and social-ecological systems and is harnessed in times of need is not always evident. To understand how knowledge may be more effectively brought to bear on disaster resilience we argue that a deeper conceptualisation of knowledge is needed that spans disciplinary boundaries and communities of practice to consider how knowledge is encoded in memory at and across multiple scales. “Disaster Memory” intends to explore this through a series of case studies of different types of disasters around the globe. We will be chairing a session at Resilience 2014, called “Knowledge for disaster resilience: Exploring memory, governance and resilience in practice” on Tuesday 6 May at 3:40-4:40pm. McIntosh, R. J. 2000. Climate, history and human action. Pages 1–42 in R. J. McIntosh, J. A. Tainter, and S. K. McIntosh, editors. The Way the Wind Blows: Climate, History and Human Action. Columbia University Press, New York, New York, USA.